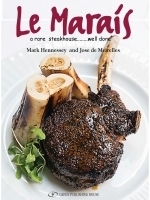 MARK HENNESSEY is executive chef at Le Marais NY. He began cooking when he reached the age where he needed more food than his poor mother could prepare. After graduating the Culinary Institute of America in New York, through which he served an internship at the Scottsdale Princess Hotel in Scottsdale, Arizona, he went on to become sous chef of Stingray on the Upper West Side. Following a four-year run at Les Routiers, he became executive chef at the kosher restaurant Levana, paving the way for his (so far) eleven years at Le Marais, the city's only kosher French brasserie, renowned for its excellent cuisine and in-house retail butcher shop.